Turn Back Time: – Life through the Shop Window. Over the years as supermarkets appeared some of those traditional shops closed down and small corner shops selling many of the same things started to appear, often staying open much later than the new supermarkets. As the supermarkets stayed open for longer and longer hours even many of the small corner shops disappeared. The Town is remembered as a thriving shopping centre, with all of Church Street, Market Street, and Current Lane filled with shops staying open as late as 10pm on Saturdays and 8 pm other nights. 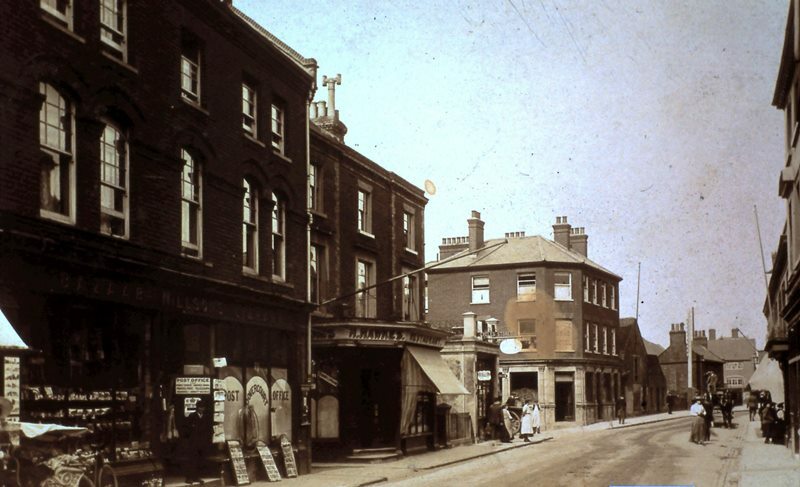 Many years ago old Harwich had a great diversity of shops: on the corner of Golden Lion lane was the Cash Stores, which sold sweets and cigarettes, a few yards beyond them was ‘Walfords’ a general grocery store. At Christmas time they use to have a couple of electric dummies in the window an old lady knitting. Over the other side of the road, further back, was Maggie Hynatt’s, which was a junk shop which sold comics, old clothes. 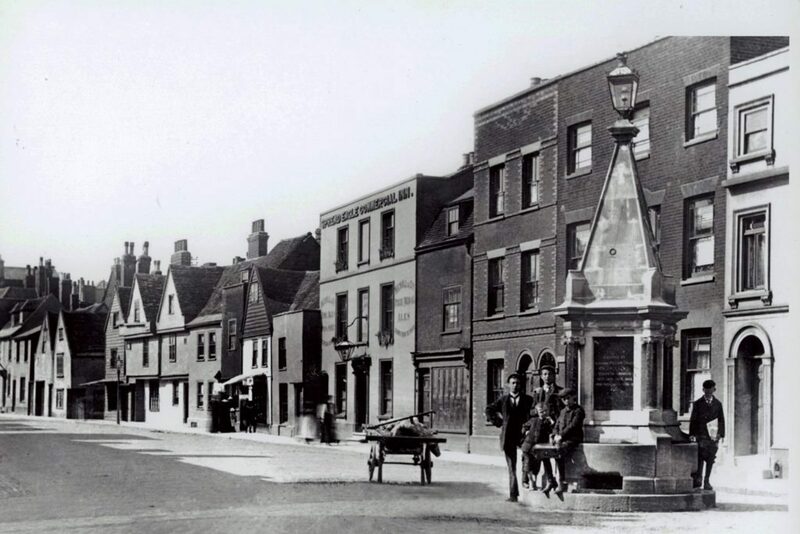 Harwich was also growing, with the hustle and bustle of the main shopping streets, Church street and Market street, the busy scenes on the quay front and piers, the noise and laughter from the many public houses, all thriving on account of the navy personnel stationed here . Posing for the camera in Church Street at its junction with Market Street and Currants Lane are some of the local children in the early 1900s. Woodward’s. the chemist and ‘supplier of photographic materials’ occupied the corner premises. It is said that Mr Woodward would ‘pull’ a tooth tor a shilling and then tell his patient that a pint of beer was the best painkiller, with the Duke’s Head on the opposite side of the road and the Royal Oak and King’s Head in Market Street. 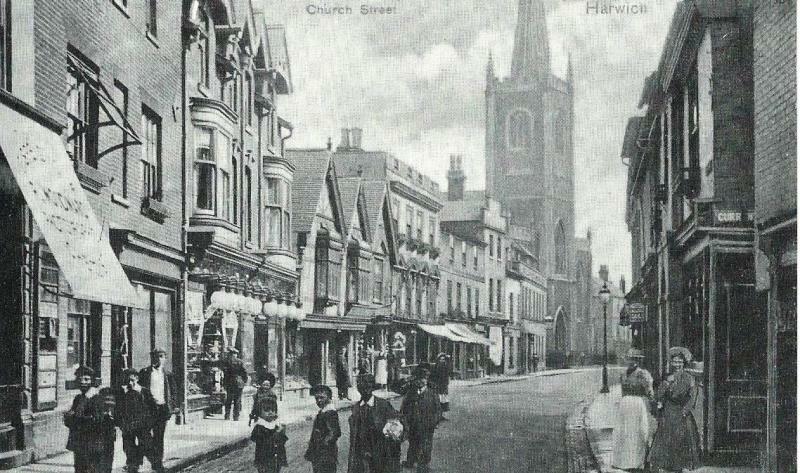 A view of Church Street showing a complete absence of traffic, and not as much hustle and bustle as might be expected. 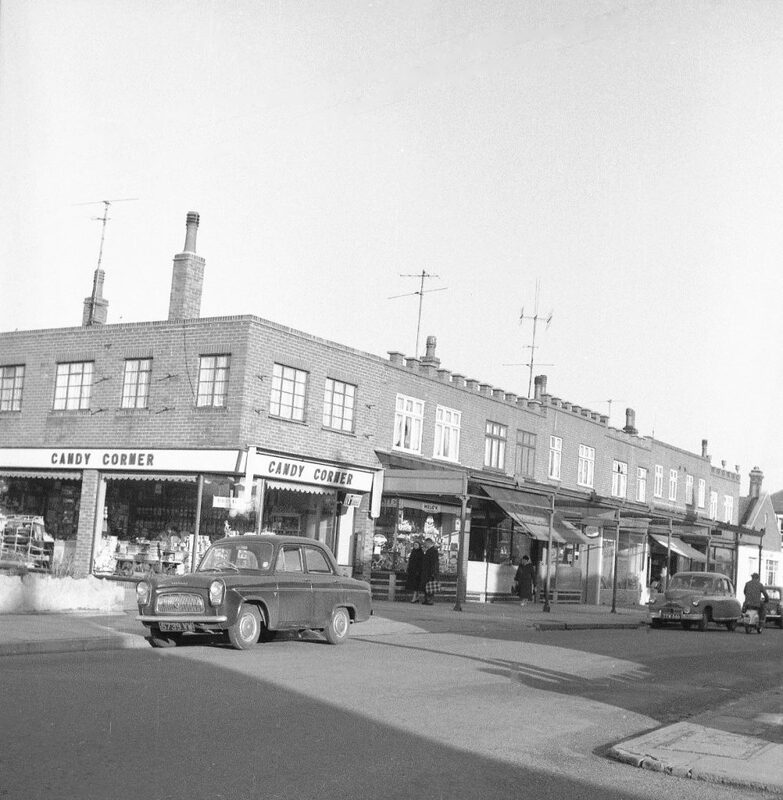 The local Cooperative Store can just be seen in the right foreground and next door Crane’s Fancy Bazaar, the shop was a children’s paradise at Christmas, with toys and dolls in the window. a popular store, they advertised ‘Cutlery and plate, table and fancy glass, dinner and toilet ware, brooms, brushes and baskets. iron and enamelled ware – we always have a big stock of all these goods at lowest prices.’ Costick (butcher) and Hayhoe (Greengrocer) had the next two shops. The sign of the Singer Sewing Machine shop can be seen with the Harwich Free Press office run by the Watsons. The Guildhall was the Police Headquarters at this time, under Inspector Coppin, with 2 sergeants and 9 constables. On the other side of the road was Stead and Simpsons. Jacksons who published the ‘Newsman”, Saunders the ironmonger and the London Central Meat Company. Sheppard & Co. 15 Church Street. My grandparents, William and Maria Sheppard, had originally moved from Ipswich to Ramsey in 1892, after William found himself employment at Home Farm. They eventually settled at what was then 19 Albert Street, with their five children, Ernie, Sidney (my father), Ethel (later Mrs Heath), Arthur and Reginald. Until his retirement, William worked as a labourer on the railway quay and later at the gas works. Following the marriage of my parents, Sidney & Edith, they also lived with grandfather on Bathside – my sister, Dorothy Elsie, being born in 1923 and myself two years later. 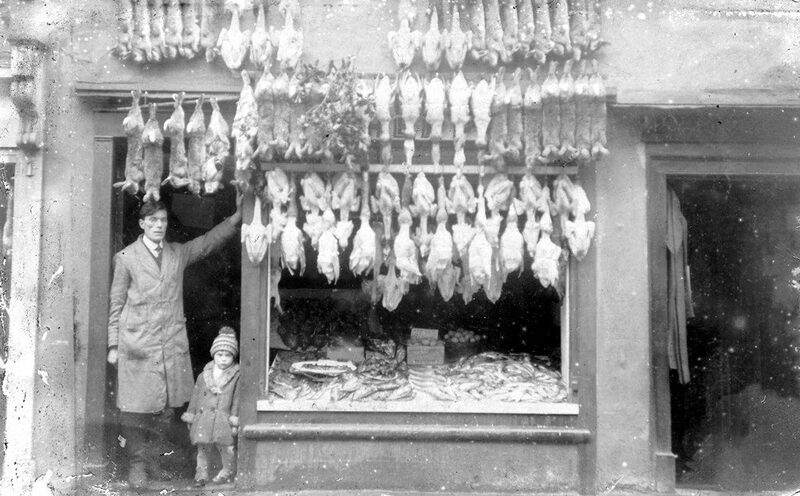 Our father, Sidney James Sheppard, had trained as a fishmonger with Denney at 8 Currents Lane and, following my birth, ran his own business at 15 Church Street, selling rabbits and other game, as well as fish. With the decline in trade that came to Harwich during the Depression, our mother would mind the shop whilst father sold fish from a carrier cycle that he rode through the villages between Dovercourt & Mistley. When we were older, my sister and I would sometimes cycle out to meet him by Bradfield church, as we knew that he would always pass there to return home along the Harwich Road. I wonder what went through his mind as he pedalled through the countryside, with leg pains from wounds he received at Gallipoli twenty years earlier, and not knowing whether he would earn enough to support the family that week? Father eventually returned to work for George Denney in Currents Lane and we moved from Church Street to 37 Fernlea Road, where I was still living when I began my employment with the Post Office. Crane & Co. 19 Church Street. The stock held was large, and comprises among others household utensils in iron, tin. and earthenware, English and foreign fancy articles, toys of all kinds, combs and brushes, baskets. The Co-op Grocery Store. 20 Church Street. The Co-op opened its first shop in Harwich in 1874 at 20 Market Street then transferred to 20 Church Street in 1887. 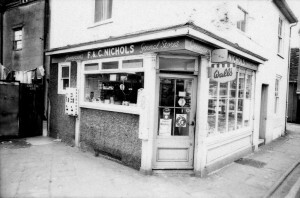 After serving the Harwich community for over 125 years, the shop was closed in 1999. Mead. 24 Church Street.The former Grocery store and bakery, many of the local Trinity House crew would get their provisions before going to sea each month. 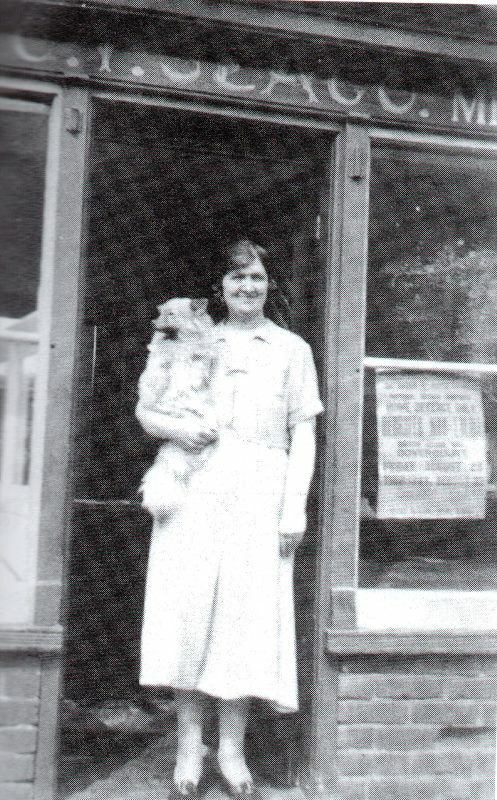 The lady in the photos is Muriel Drew (Britton) the shop was run by her parents. Photo and text by Wendy Durrant. In the late 1920s Stead and Simpson opened a branch at 53 Church Street, next door to Jackson’s at 54 who’s business was very successful and renowned as an excellent bookseller, who had the ability to locate any book not stocked. they also printed and published, The Harwich Newsman on the premises. the shelves were always full of stationery and local post cards. other shops on this side of the road included Blosse,whose hairdressing business had been in existence for many years at number 57,Parsons (jeweller), Bevan and Stooke (chemist) and Bernard’s which was owned by T.H.Bernard, outfitters to the Royal Navy, who also owned a factory in Main Road. The firm made uniforms for most of the armed forces. David Will’s Bakery. 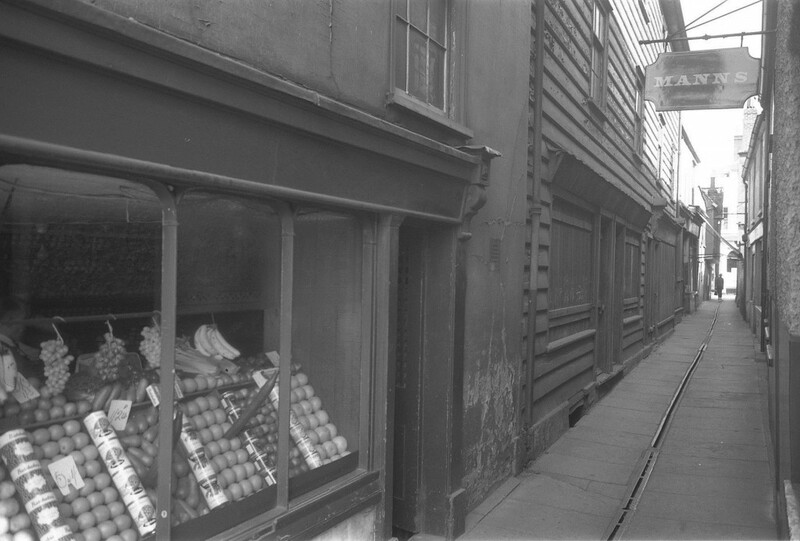 The shop in Church Street had been a bakers and confectioners since the mid-19th century. Mr Wills was up against stiff completion from Brewster, Creswell & Gould, but managed to gain a foothold for almost 60 years. They opened a 7am each day for the sale of rolls, the rolls were delivered by the roll boys often leaving the bake-house when it was still dark, the delivery service continued right through the Second World War, but was discontinued as a result of rationing at the end of the war. The Wills family moved to Harwich from Christchurch, Hampshire. At the time of closure they recalled their shop was always open until 9 p.m. on Saturdays and 8 pm on other days. The business eventually closed in 1962. A busy view, the products advertised are interesting – Carless petrol is for sale. Pullar’s dyes, Jaeger wear, Stephen’s inks, Singer sewing machines, to name but a few. 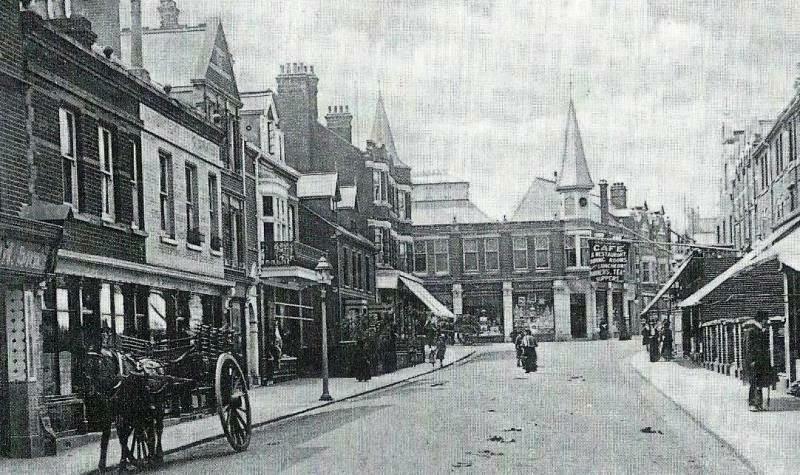 In the distance, is the grocery store of Harry Wright, whilst immediately opposite can be seen the distinctive building of Woodward’s Chemists, Robert Woodward also practised as a dentist and would often pull a tooth out for a shilling, Mr Woodward had taken over the business from Mr Worts in 1898. Mary Bullock had the tobacconist at 57 and D Wills, the baker, advertised the fact that he was a “Gold Medallion Baker”, and that his premises were always open for inspection. Farrow, 44 Church Street. 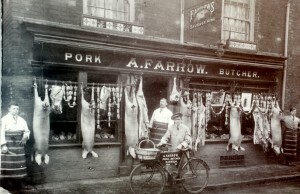 Farrows pork butchers was one of four butchers in the town, later became Good’s Fish shop run by Victor Good and his wife. his shop was one of four pork butchers in the town. 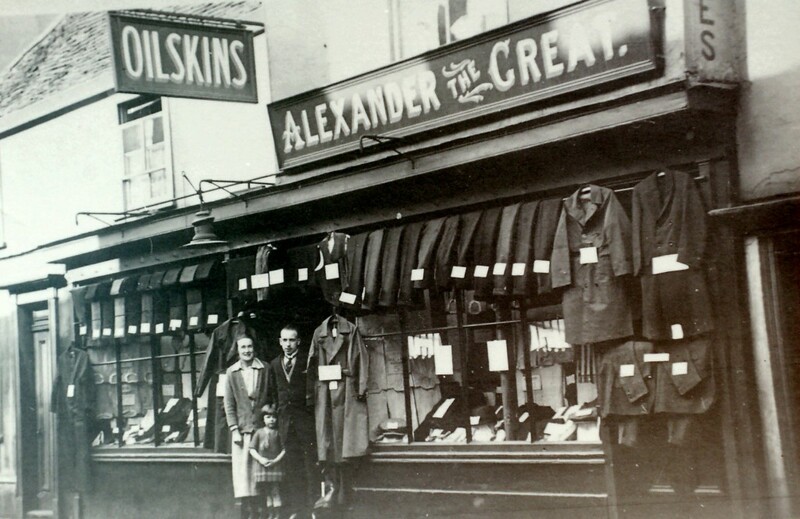 Alexander the Great Clothing, 53 Church Street. provider of clothing and oilskins to the local fisherman and seafarers. 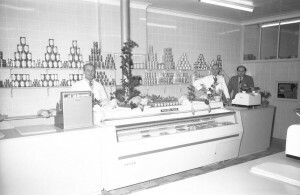 The store was managed by Mr Hayhew and his wife, in the 1960s the shop became Anglia Marine. F.Everard & Son, 58 Church Street. The tailoring and outfling business had a fair number of representatives in Harwich. The name of Everard had been associated with this trade for more than thirty-five years, the three storied building, with its fine plate-glass window, presents attractive and a handsome appearance, The interior, consisting of shop with workshop at the rear, is of peculiar elegance in its fittings and appointments. The several department s of the business comprise of tailoring, clothing, hats, hosiery, gloves, shirts, etc. C.F.Bevan. Pharmaceutical Chemist, 62 Church Street. the business was originally founded in 1828 and was taken over by Mr Bevan in 1850. the shop was well stocked with drugs, chemicals, perfumery, toilet, and nursery requisites, and a miscellaneous assortment of goods appertaining to the trade. A Goods trade was also done in mineral waters, of which the proprietor had always a good supply. These included soda water, potash water, seltzer water, Lithia water, ginger beer, ginger ale, and lemonade. Besides the above there was also a stock of foreign mineral waters, and Eau-de-Cologne. Owen Coates. 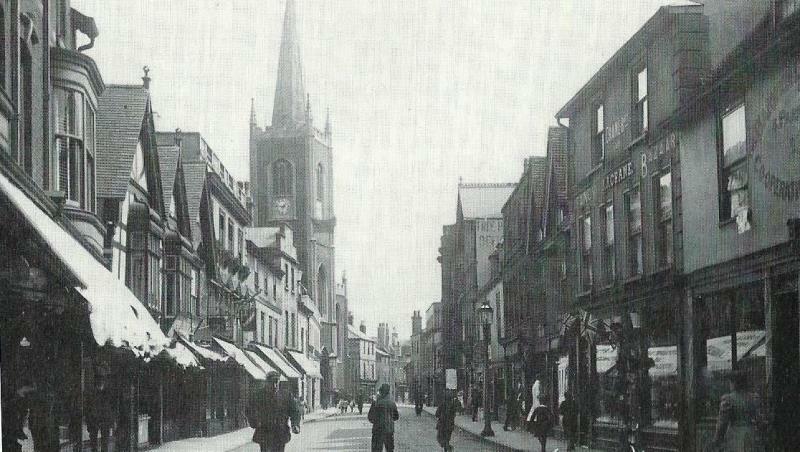 Church St. Mr. Coates who lived in Lee Road was a photographer producing postcards, sheet music, gramophones and pianos.to attract customers a pianist would play in the shop, the shop was demolished after the Second World War and replaced with flats. Harwich Radio & Cycles Supplies. 70 Church St. 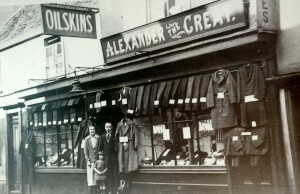 The business started in 1930 under the management of Mr. A.F.Cheesman and Mr. Percy Hawkins as a sleeping partner. 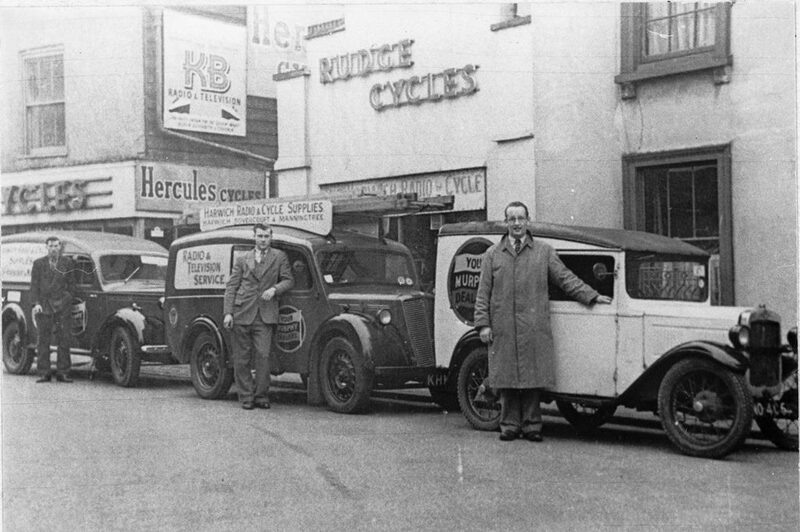 In those days the firm was called Harwich Radio and Gramophone Supplies, and it occupied just one small building. After his father’s death in 1954, John Cheeseman took over. He was not new to the business, as he started with his father when he was 15. In this picture Left to Right are Bill Rogers, John Cheesman & Alf Fragley. 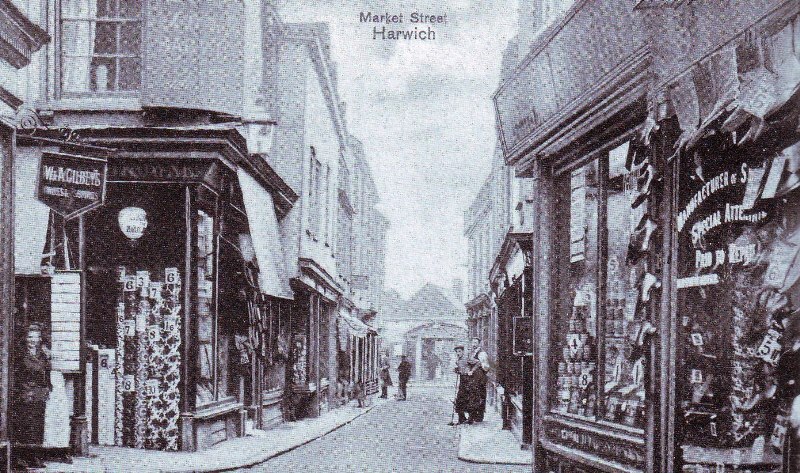 Harwich was a very prosperous and thriving town before the First World War and people would come from miles around to Market-street, which was renowned as a shopping centre. Market Street was a particularly busy shopping area with Spurge’s selling clothing, the International Tea Company selling groceries, Calver the fruiterer, Cooper the clothier and Kettle the tailor amongst others. The whole of the area would be a hive of activity as shops stayed open till 10pm on Saturdays and 8pm most other evenings. Here could be found tobacconists, drapers, clothiers, bakers, greengrocers, tailors, chemist, boot makers and 3 butchers. 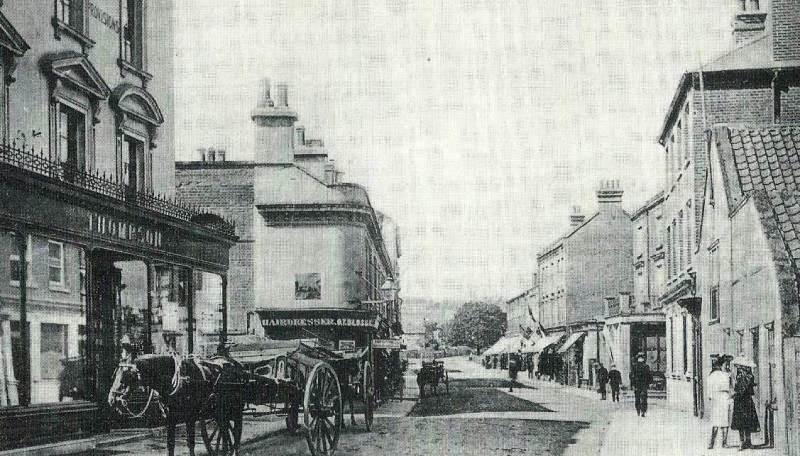 Looking towards the entrance of the old Harwich Market, this was paved using wooden blocks in the 1880s. Groceries could be purchased from the International Tea Store and over the road was Browne’s Drapery. Looking back at the 1950s there was 2 butchers Roberts & Pattle in Market Street. W.Went. At Mr Went’s shoe shop Number 3 Market Street, one could find every description of boots and shoes for sale. Went’s had been in the trade since the 18th century and also undertook repairs as well as manufacturing their stock in the workshop at the back of the premises. Later in 1830 he opened the first shoe shop in Harwich at 3 Market Street which he brought from Mr Haste ,before that it had been the Swan Public house ,his son William II , followed his father into business and eventually took it over when William I retired , William II lived over the Market Street shop where him and his wife Rosie raised eleven children. Norman and Tricker. 5 Market Street, Fred Tricker was a well-known pork butcher who sold his pork sausages for 1s. per ib., there were no fridges in those days, but the local folk managed to keep their supplies fresh. 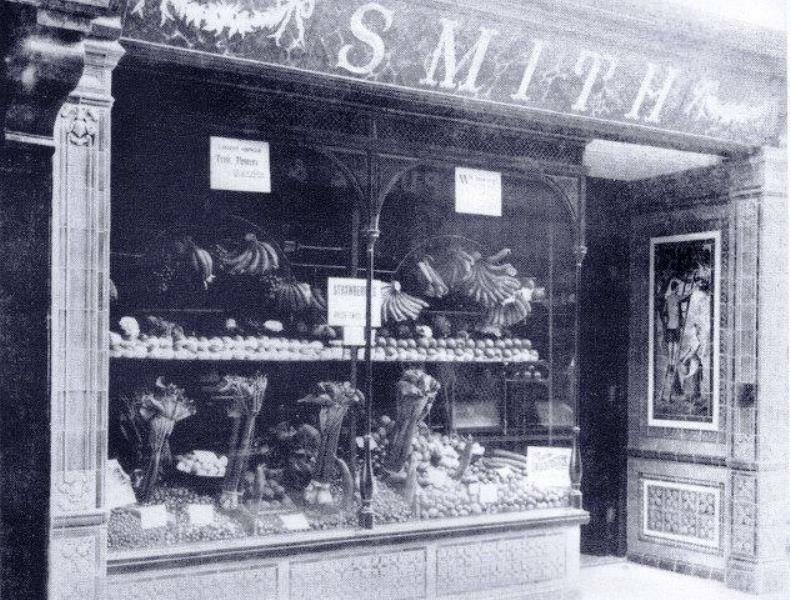 Smith’s Greengrocers, 21 Market Street. The shop front remains much the same today and is now the premises of Harwich Old Books, behind the shop there is a carving known as the ‘Little Queen of Market Street’. Further back in the rear of the building there is another carving of a ‘King’. Walk through Market Street today and you are unlikely to see many people. very little retail therapy with only a general store and bookshop. Shops have been replaced by flats which stand empty or have been demolished. Market Street is almost residential. Looking beyond the fountain down the major road into Harwich, which follows the typical north-to-south medieval pattern. A good mix of differing quality residential properties and retails shops. The large white building behind the fountain was owned by Mr Peachey and divided into apartments as was the next building. The small shop was Messrs Woolfe and Osborne’s (pawnbrokers) – certainly well utilised at this time, if only from beginning of week to pay day. Down the road as far as Church Lane were more residential properties as well as Howard (bootmakers) and Leggett (fishmonger). The Co-op Bakery. Mr Carter owned the premises, baking bread for the Co-op. In 1923 the shop became greengrocers until 1962 when Mr Humphries son Frank took over the business, in the early 1800 the premises was an ale house called the Six Bells. Humphreys Bakery. The bakery in West Street had been in the Humphrey’s family for over 70 years. Frank Humphrey had produced the mayor making spiced bun kitchels for more than 40 years. 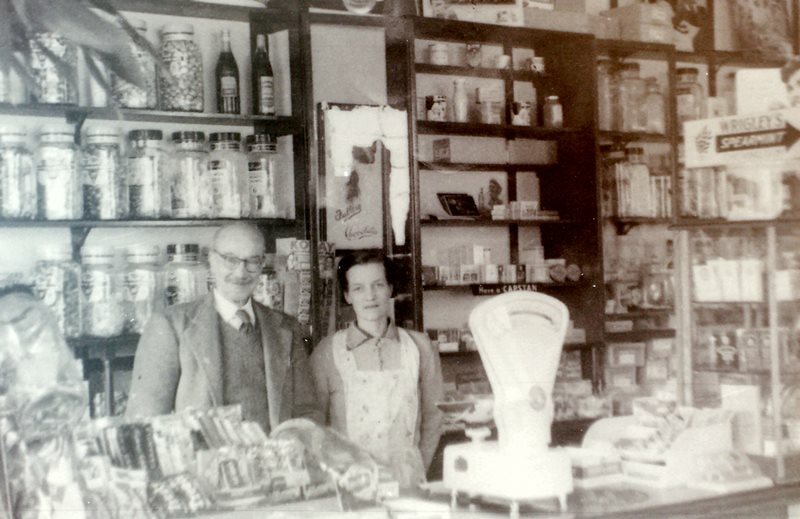 Mr Humphrey’s parents, Stan and Ethel, took over the bakery when the Co-op sold it in 1936. Mr Humphrey’s ran the shop with his wife Liz, before retiring in 2003. In 1900 was a mixture of different building styles, reflecting the fortunes and activities of previous generations. Opposite the Corporation School was the shop and store of Parsons & Woods, furniture and antique dealers. The Parsons family were in business in Harwich in the 1850s before Samuel Parsons opened furniture brokers shop in Church Street during the 1870s, and then moved to Kings Quay Street a few years later. Frederick William Haywood and staff. Frederick Haywood and his staff outside of his Butcher’s shop in 54 Kings Quay Street. He supplied a great deal of meat to the Armed Forces in the Harwich area it was not unknown for him to take over £100 on a Saturday morning. his Father had been a Butcher in Birmingham then Cheltenham and Gloucester and Grandad’s brother was also a Butcher who set up his shop in Swindon. Dad worked with him for a while in Swindon and then for some unknown reason he decided around 1895 to move and set up business in Harwich, where he met and married a local girl and there he stayed. During his retirement he actually worked for Tricker in Market Street but slipped whilst working there and broke his hip that led to his death in 1946. Information and photo by Peter Haywood. Johnny Barker. Mr Barker was originally a travelling showman with the early picture shows. In 1911 he came to Harwich as the first film operator at the Palace Cinema, and soon afterwards opened a sweet shop at 11 Kings Quay Street. I remember seeing the old lady rolling out bit sheets of candy and breaking up peanut brittle with a little silver hammer, and the stripy humbugs and toffee apples. I can still smell those sweets we used to love visiting them. Can remember saving up my pocket money and just standing in the shop boggle-eyed trying to work out how much to spend, what to buy, the smell of treacle toffee, aniseed balls, gobstoppers. All good all gone, so sad, but for us sheer pleasure at the time. 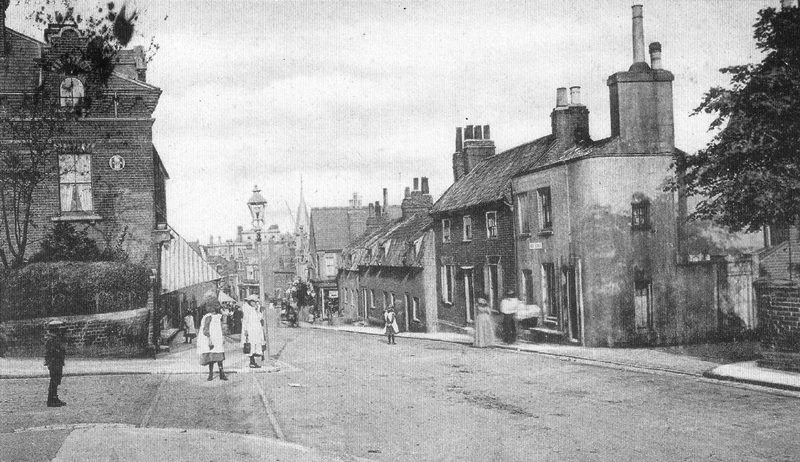 The High Street had grown considerably since 1900. All of the houses have become shops, partly due to the old established Harwich shop owners looking to the future and either moving their premises to Dovercourt or owning shops in both towns. Once, in the days of button-up boots, Iron Jelloids, Syrup of figs and five Wild Woodbines in a paper packet for two pence, Dovercourt had shops with counters, not checkpoints. They were owned by shop-keepers who knew every customer by name, not by purveyors of merchandise who know their customers only as consumer outlets. Many shops provided chairs for customers. This was a time when shopping was not to be hurried. It was a long time ago, but that was what shopping was about. 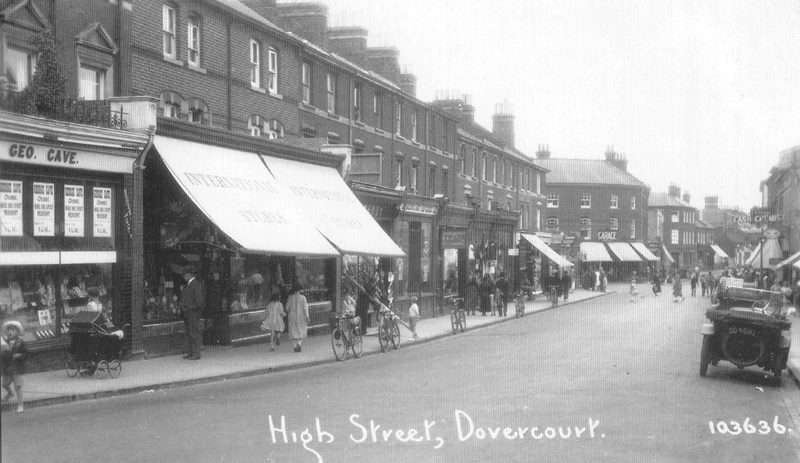 Even those who have known Dovercourt High-street for many years may find it difficult to keep track of all the changes that are now taking place rapidly. 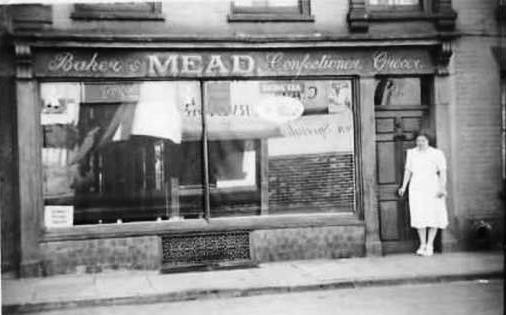 Well known in Dovercourt “Gages” the confectioners shop at 158 High Street Dovercourt, remembered by locals as “the best sweetshop ever”, “brings back lovely memories as a child. “I remember the lucky dip bran tub and getting a little interlocking metal puzzle”. Mr Ernest Gage passed away in 1960, but Miss Lillian Gage continued to serve in the shop until her retirement in 1961, sadly Miss Gage passed away in 1963. Tumilty’s. The handsome building at 174-6 High Street is regarded as a showpiece illustrating the immediately identifiable style along which all present and future branches are to be modelled. Throughout over 50 years of trading, Tumilty’s basic concept has been to provide quality-proven equipment and products coupled with a first-class after-sales service. 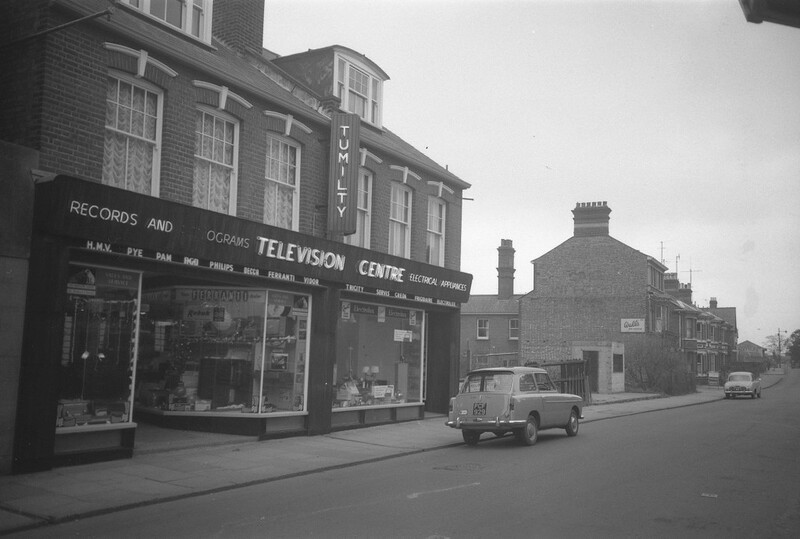 During the 1950’s Tumilty’s was one of the first shops of its kind in North-East Essex to launch a TV rental scheme. Charleys. 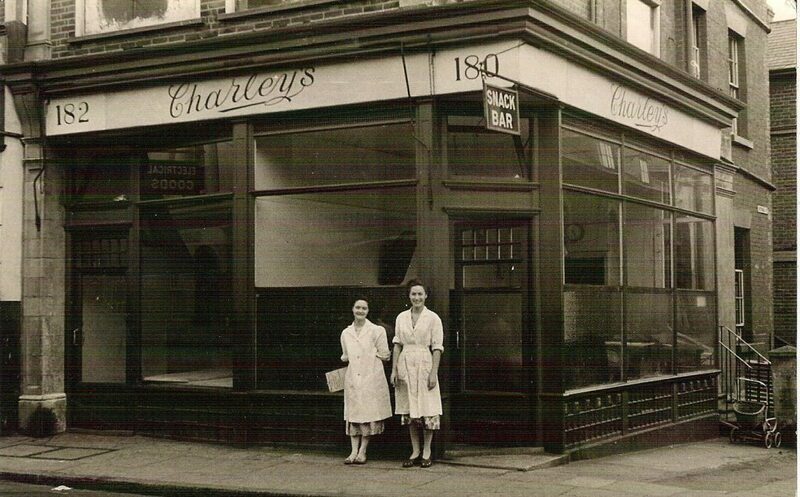 180-182 High Street.Charley and Miss Garnham had a fish shop on the corner of Victoria and High Street during the 1940’s. In the 1950’s it was operated by 2 of their daughters, Sybil Thraxton and Jean Crone. One part was the wet fish shop and other the fish and chips and café. I lived here till about two and half or three, then we moved to Cliff Road, where my twin brothers were born. I think this must be the place where a refugee came in, war time, and asked my grandfather for food. He had fled from Jewish persecution in Nazi Germany. I am not sure if he had come straight from Germany or from elsewhere as there are different stories I believe. But he then married my mums sister, aunt Barbara, so became my uncle Tony. The youngest of the Garnham girls is now 82. The oldest, James, was killed in 1940 so not many left alive who remember any of them. 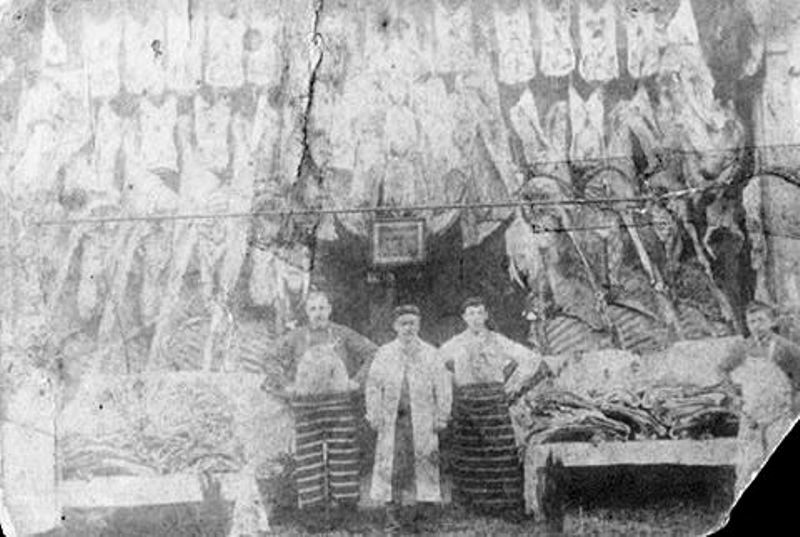 Charley and Miss Garnham operated several fish shops in the area. 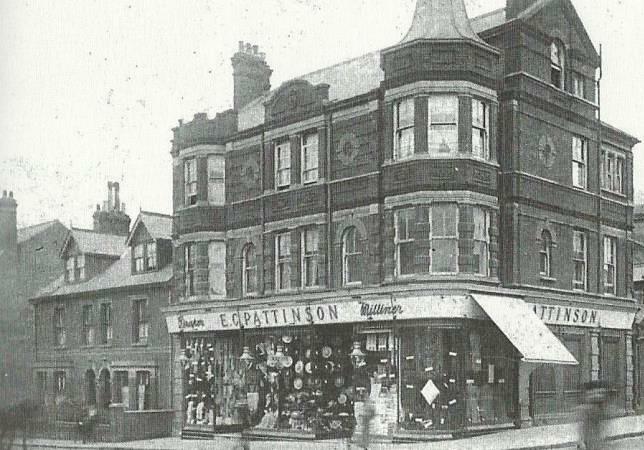 W.Thompson’s family grocery and tea shop situated at the bottom of Orwell Terrace. They also sold wines, spirits and bottled ales, acting as agents for W.A.Gilbey. On the opposite side of Orwell Terrace is the hairdressing establishment of Oliver Blosse. However, if one then looks up the High Street and into the distance, the Cooperative Store has not yet been built, with the house and large tree yet to be removed nor have any of the other developments at that end of the High Street started. Dovercourt developed steadily from Orwell Terrace in the late 1800s. Looking up Main Road, the shop at the bottom of Orwell Terrace belonged to watchmaker E A Race. Ambrose Race died age 42 in 1898 of heart failure and later photographs show the same shop owned by O T Blosse, tobacconist. The view up the street is clear and still mainly residential. 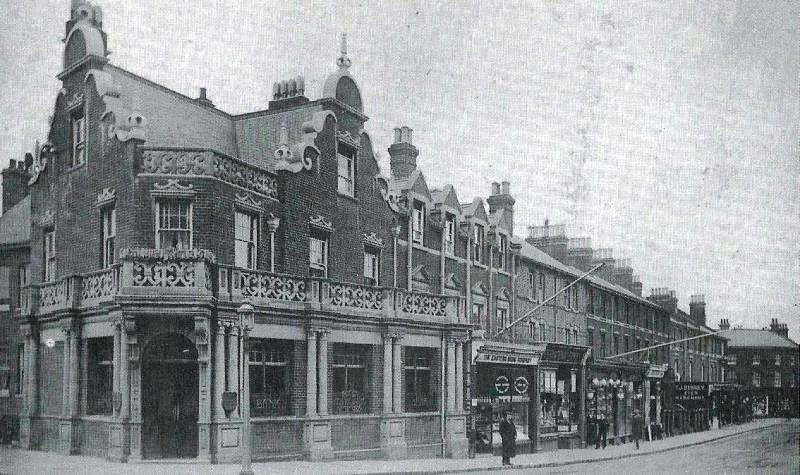 The Kings Arms stands opposite, and the shop which was to become Harryott’s Cycle Shop is across the road. 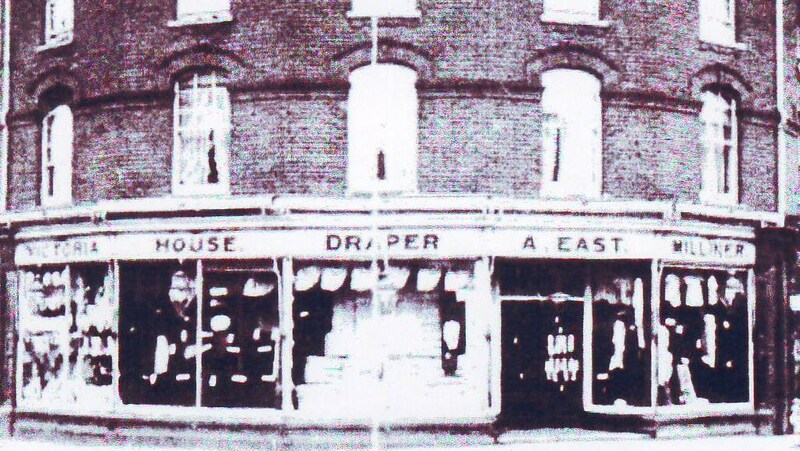 This picture shows the Dovercourt Post Office in the premises of John Bullock Willson, occupying 67 and 69 High Street, later occupied by the Eastern Electricity showrooms. His shop sold many things – as the name ‘Bazaar’ implies – including newspapers and magazines. stationery, and also operated a library. The next building was the restaurant of N.Hawkes, later occupied by ‘Marjories‘ and on the corner of Victoria Street was the Harryotts Temperanee Hotel and also cycle shop to supply the growing interest in cycling. These premises became the centre of attraction for the wrong reason on the night of October 8th 1922 when the premises were destroyed by a great fire in spite of the prompt attendance of the fire brigade. Photographed in 1904, with the main activity outside Wilson’s Bazaar with its large display of postcards, library, post office, newspapers and magazines. Over the road, next to the Queen’s Hotel, is Thompson’s Cash Stores with its large gas lamps. 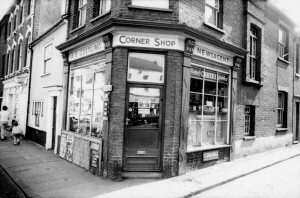 Wells’ stationery shop is on the corner of Station Road and numerous other shops have been built beyond Wells including: Denney (fishmonger), Smith (grocer), Stannard (Watchmaker) and JT Ward (hairdresser). The Maypole Dairy, just before you reached Station Road, was another attractive shop. It was cool and clean smelling, a little world of marble counters with a tiled floor. Tiles of green and cream also patterned the walls, depicting country scenes. A rich bed-brown cow grazed on luscious green grass, fat geese and ducks on a smooth pond and apple cheeked children danced round a Maypole. The shop was always full of noise, the chattering of customers, the clang of weights on brass scales, the butter patters set a rhythmic racket as they sliced a chunk from a huge cube and shaped it with wooden pats. At the top end of Station Road were the premises of Agnes East. An extensive building known as Victoria House, the premises of Agnes East ensured local women could buy the ‘latest fashions and accessories’ and they stocked bathing costumes and children’s jerseys as a specialty. F H Dennant’s Fancy Store specialised in crested china, glassware, toys and fancy goods, with postcards and seaside novelties for the visitors. 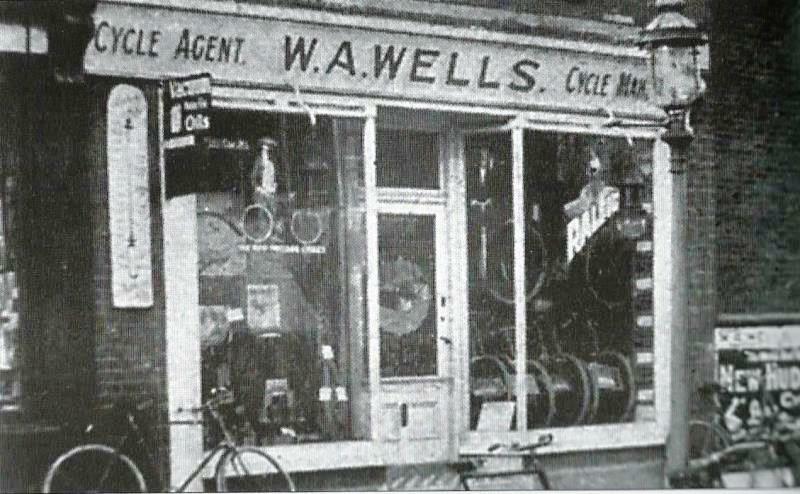 A famous Dovercourt retailing name for many years was Wells. This is the Station Road shop front of W A Wells, the Cycle and Motor Agents, who moved there in 1907. The trend towards using a bicycle was growing and proving popular in the early 20th century. Cycles were advertised from 5 to 17 guineas, cycles were repaired on the premises and all types of spares could be purchased. There was also a market for petrol, spark plugs and motor oils for the more adventurous. Dunn’s the Butchers. 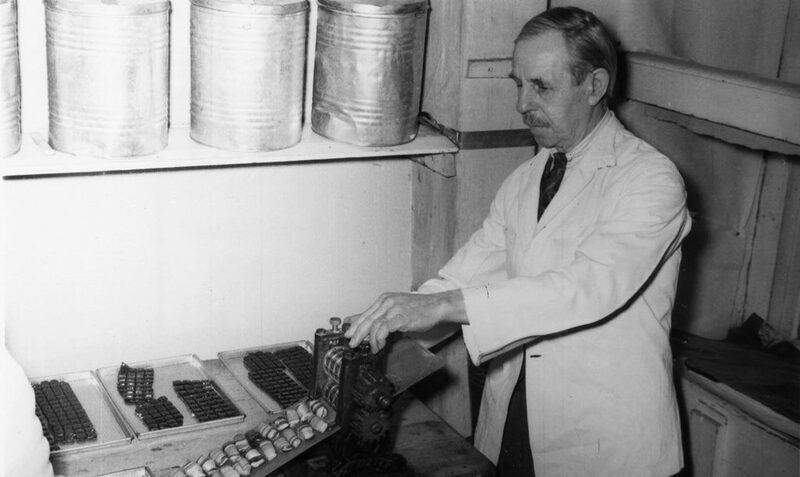 Norman and Wilfred Dunn took over the business from their father, James, in 1946. The business has been in the family since 1890, when James broke the family tradition and became a butcher instead of a greengrocer, like his father and grandfather. But neither of Norman’s two sons nor Wilfred’s stepson are interested in the trade and before long the old shop’s marble slabs and tiled walls will just be memories of an age gone by. The brothers have been butchers ever since they left school, both Dovercourt born they were trained by their father in the days when life moved slowly but despite the changing times, Norman and Wilfred have tried to keep the personal touch and have always had time to stop and chat to their customers. 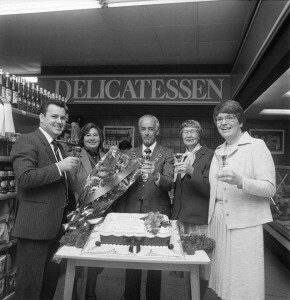 The shop opened its doors for the last time on the 30th January 1977. 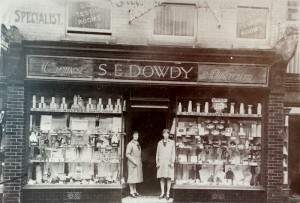 Next door, going up the High Street was Dear’s the confectioner and Dowdy the Chemist. Beyond that and all most hidden were the two shops of Grice and Lambert (gent’s outfitters). The shop with the first floor balcony is the butcher’s, W.B. 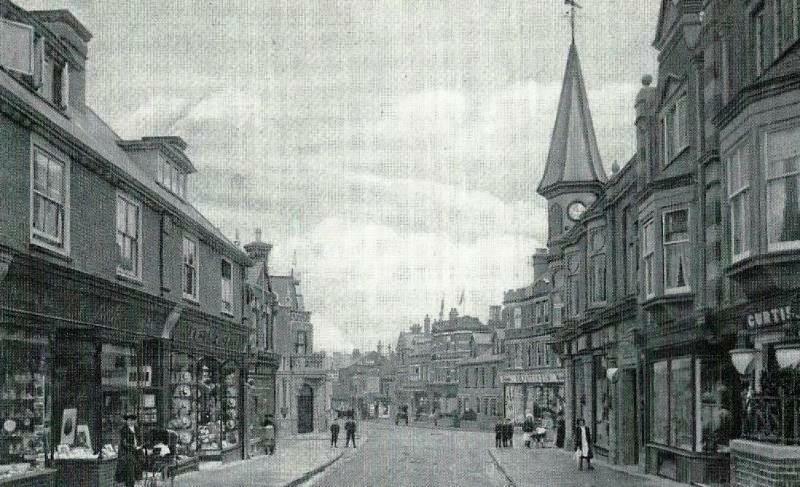 Greenwood, who also had shops in Harwich, and Parkeston. Thompson’s would soon occupy the next space with their Model Store in 1906, and Pattinson’s completes the shops on this side of the road. The Cooperative store dominates the centre background whilst on the opposite side of the road the large flag overhanging the road is advertising Antonio Mastaglio’s Continental Café and Restaurant. Here residents and visitors had the opportunity to try French and Italian cuisine as well as more traditional meals. Not all of that side of the High Street has been developed with a number of private residences still occupied. Thompson Model Stores. 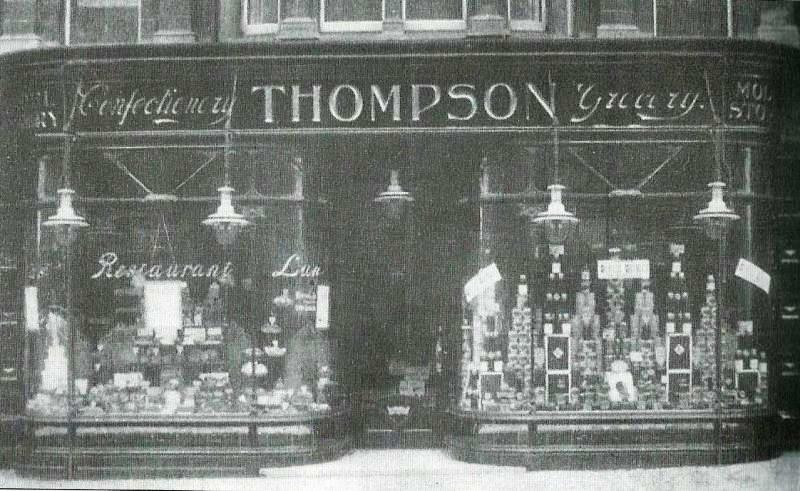 W W Thompson opened his Model Store in the High Street in 1906. He came to Dovercourt in 1884 joining ex-mayor Martin King who owned a grocery store and off license at the bottom of Orwell Terrace. He became a partner and eventually took over when King left the district. As a member of the Plymouth Brethren, he was a man of strong religious beliefs and conviction, holding regular services in the Assembly Hall and open air services in Orwell Terrace. The story goes that when a heckler asked him to reconcile his beliefs with his selling of “spirits which are the ruin of the country he could not, a duly sold up and had the new store built and opened in 1906. The Tea Rooms, Thompson’s Model Stores. The store sold groceries downstairs and had team rooms upstairs where people could have tea and cake or a luncheon. There was even a garden roof for the very brave. 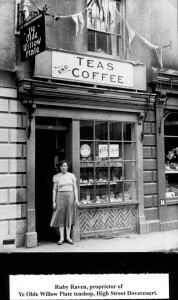 When the store opened people were invited to inspect the premises and were treated to tea – good public relations at that time. 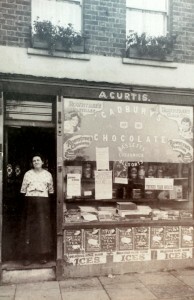 The shop claimed to have brought London retailing to Dovercourt and set up a reputation for high class confectionery. At this time there was no pre-packaging and 28 lb. bars of salt had to be cut with copper saw into small units, sugar, tea etc. all had to be weighed out into individual portions by the apprentices. The store closed in 1959. Norman and Tricker’s. This view of Norman and Tricker’s butchers shop front would give Environmental Health Officers palpitations. The displays of many different types of meat, including a large number of rabbits, were there for all to see and touch. The potential problem was highlighted in the Public Health Report of 1912, which described the severe outbreak of diarrhoea during that year’s very hot summer. The Report implied that is was probably due to the excessive number of flies and the need for cleanliness in food handling. 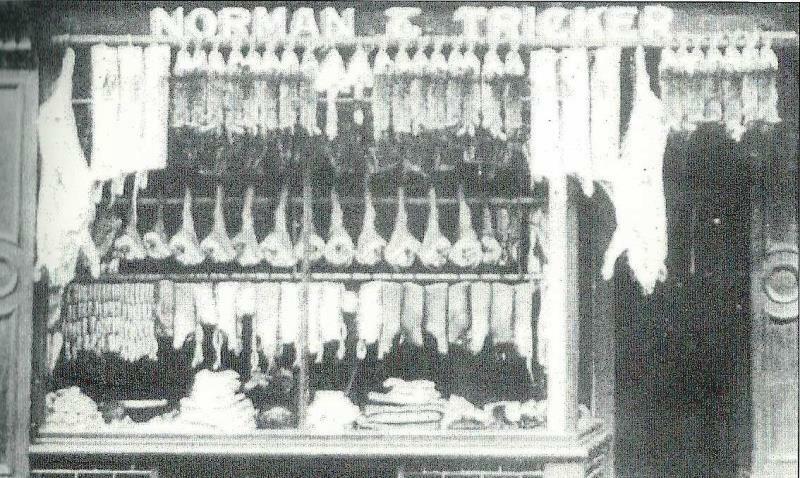 Norman and Tricker had shops in Market Street and High Street, Dovercourt, offering ‘quality at the right price’ and advertising ‘home-cured hams and bacons, fresh pork sausages daily, rabbit and new-laid eggs’. 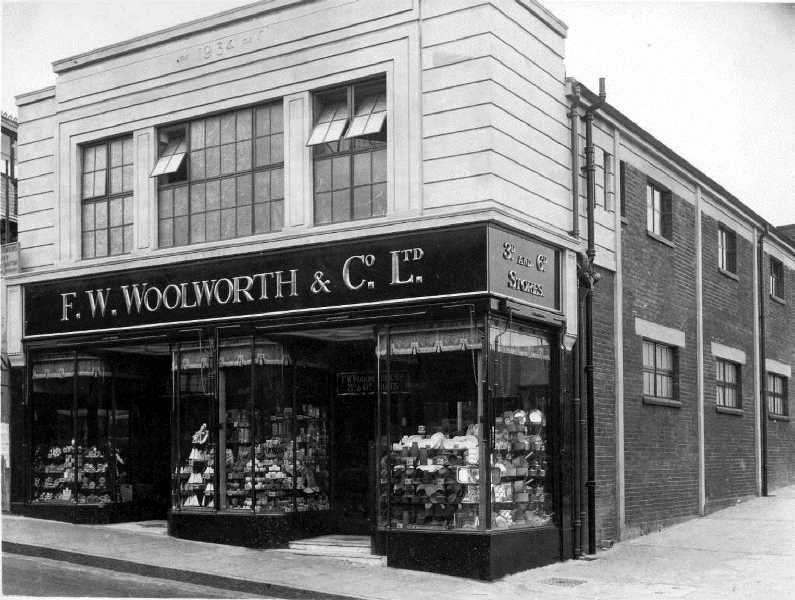 In 1910 when Dovercourt was developing as a seaside town William Went opened a shop in 28 Station Road now Abletts later this was sold to Sewell’s dairy when William II bought 91 (222) High Street from Self’s Ironmongers to make his well-known shoe shop there. William died in Fronks Road in the 1930′ he was succeeded. In the family business by his sons William III, who took over the market Street shop, and Harry who took over the Dovercourt shop and it was there that Eileen and Roy were born. When Roy was on demobilisation leave in 1936 William III manager of the Market Street shop, died and Roy abandoned his town hall career to enter the family business. Roy became manager of the High street shop in 1953,Very much a family business, nothing was ever too much trouble and the staff took a personal interest in seeing that the customer was satisfied. They also took pride in knowing the first names of all the children of their regular customers. looking down from its junction with Kingsway. On this side of the roads at this time were the International Stores, Went’s boot shop, the British Argentine Meat Co, Norton’s, Rice’s, Parsons, Denney’s, Heslop’s, Allen’s, Ward’s and Well’s stationery shop. People walked freely, almost nonchalantly , in the road and just one car is parked on the wrong side of the road facing the wrong direction. This photograph shows the Capital and Counties Bank, built in 1902 by Messrs.”’ Bacon, Cobbold and Co which preceded ether developments on that side of the road, Two large flagpoles protrude into the High Street. The Eastern Drug Company have their cash chemist’s next door to the bank and the proprietor George Cave also sold wines and spirits and promoted his ‘Dovercourt Bouquet’ which was a ‘celebrated perfume of rare and exquisite fragrance. 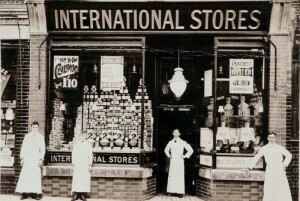 The International Tea Company’s grocery store is next to that and shops now front the residential accommodation of the previous photograph. John Self’s store is scene with its gas lamps and goods on display outside , boasting its own sports department. whilst Denney’s fish shop cannot be missed now. A building that has dominated the High Street for over 100 years. It was built in 1902 although in this photo the clock has not yet been put in place. The Harwich, Dovercourt and Parkeston Cooperative Society built these premises to include its store, billiards room, reading room and concert hall to add to the premises it already operated in Adelaide Street, Parkeston, and Church Street, Harwich. Dairy produce was available, as were ‘the best brands of tinned products’ and confectionery. The traditional attraction of the dividend was available and there was also a Women’s Guild organising speakers and visits. 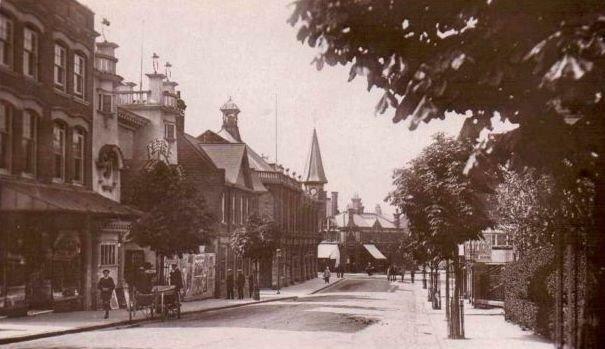 Looking down Dovercourt High Street. On the left hand side, where the Building Societies now prevail, was the studio of C.E. Bates ‘photographic artist and frame maker’, and next door was Jewson and Smith who boasted ‘the newest and smartest design in boys, youths and gentlemen’s clothing, and claimed to be the ‘leader in juvenile clothing’. 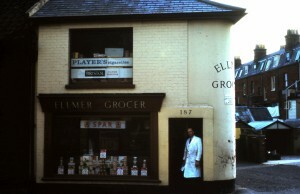 One of the oldest shops in the area was on the corner opposite the bank. Smith’s, Greengrocers is the second oldest building in Kingsway and still bears its original trading name, built in 1898 on the site of the former lodge to Holly Lodge it was owned by market gardener selling fresh produce from his shop, his nursery was on the Vines Estate, and claimed to have over 10,000 square feet of glass thus supplying all of the fresh produce for his shops. This was purpose built as a shop; other buildings in the High Street were originally private houses but later lost their bay windows when shops were built out into the front gardens. People will also remember Sewell’s’ Dairy in between. their stocks of milk were kept at the back and by the late 1930s they were delivering milk in electric vans. 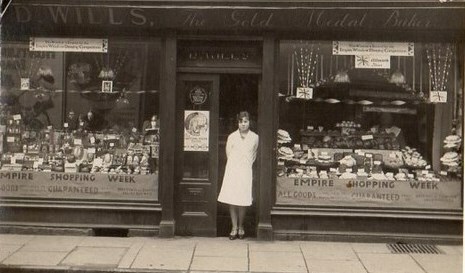 Sewell’s later moved to the High Street beyond the traffic lights. The car park between the Alexandra Hotel and the 1936 Co-op is the uneven remains of the brick field which extended as far as Hordle Street; After the Co-op became Bowtell’s High Class Grocers. 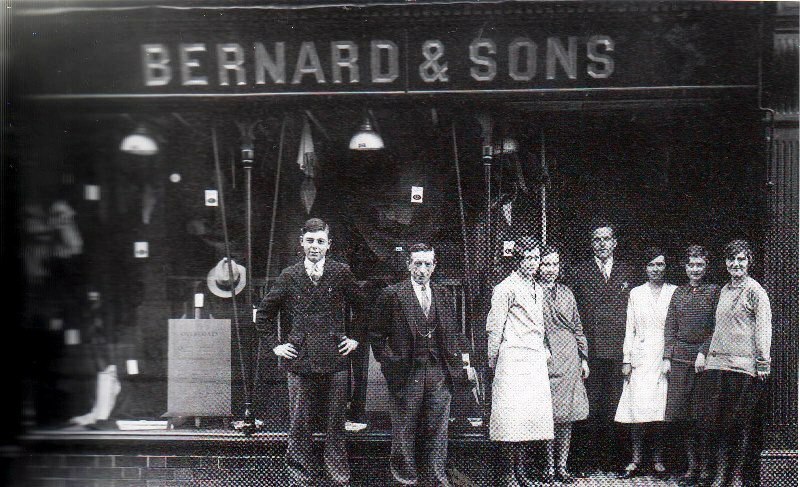 Built in 1912 for Mr Bensley, the Botwell family took over the business in 1920 and ran the business for 46 years, subsequently Fred Bowtell (from Ealing) bought 56 and 58 Kingsway. 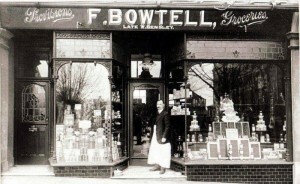 His son Stanley Bowtell carried on the business when Fred passed on.when Bowtells took on business there were no buildings between Kingsway and Orwell Terrace.. Later it transformed into Goslings and Then Gardner’s. Next came the Empire Cinema, built about the time of the First World War and closed just before the start of the Second World War. After that it was an army store and was finally demolished in 1963 to make way for Morgan the Opticians, Evans the Jewelers and the Launderette. Perhaps the most elegant building in Kingsway is Barclays Bank built by them in 1911. 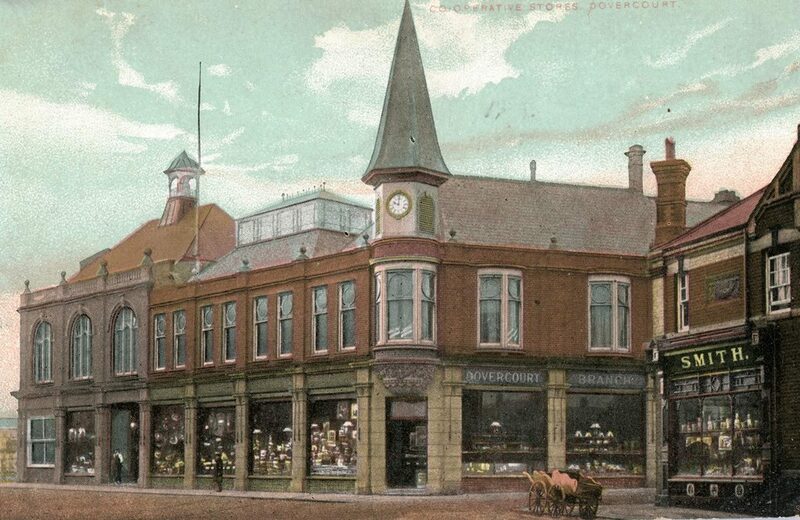 Between Hordle Street and High Street the Harwich, Dovercourt and Parkeston Co-operative society built its store, billiards rooms, reading room and concert hall in 1902. The traffic lights did not appear until after the Second World War and replaced the familiar policemen. Barnaby Rudge was formerly Marjorie Ward’s Ladies Hairdressers and Robinson’s Electrical Shop. S.Parsons & Co was built in 1930 and the Post Office in 1934. Between the two were the Grafton, a high class sweet shop, and later Parsons China Shop, and Lab’s Gentlemen’s Hairdressers, later Greensted’s Estate Agents. Reynolds started their newspaper business in a hut on open ground next to what is now the Post Office Yard, The houses between Reynolds and Nelson Road were built 1906/7 with the corner house being reserved for the Manager of the Gas Company. The block between Nelson Road and Station Lane were built about 1930. Rolling’s Television was previously Cox’s Fish Shop, and the present Fish Tackle Shop previously hill’s Boot and Shoe Repairs. The shop nearest to Dovercourt Station was originally Roche’s Café, run by a Frenchman; it did a brisk trade offering quick refreshments to Parkeston Quay workers catching the 5.45 am train. Orwell designs (earlier Lamberts Betting Shop) was added to the block in 1961. Ladies and Gentlemen’s Outfitters were in much evidence. E.C. Pattinson in the High Street offered ‘ corsets for the smart woman and the most stylish frocks and costumes’, while Edward Spurge and Son, with branches in Dovercourt and Harwich, advertised Ladies hosiery in cashmere and pure silk, tailor-made costumes at strictly-moderate prices, bathing costumes and caps and paddlers. F.Mundy, Ladies and Gentlemen’s Tailor ‘every client a person al study’, Hunter’s Clothing and Boot Stores, High Street, ‘new season’s pants, vests and socks just arrived’. and L.G.Rice, 143 High Street, ‘dress your sons in our ready-to-wear flannel suits for the holidays’ were others specialised in clothing for all occasions. On the other side of the road the houses were built about 1906. 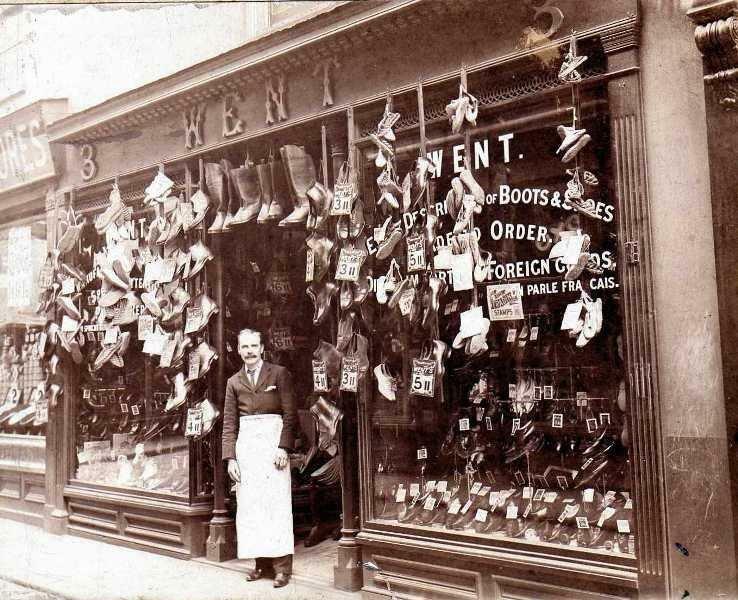 Opposite the Post Office a pair was converted into Gunn and Lamberts High-class Tailors. The tailoring was succeeded by Elizabeth’s Restaurant and that by Howlett’s Cycle Shop. Jones’ Solicitors Office was previously Fidmont’s the Dentist, and elsewhere in this terrace houses have now been converted to offices. The baronial Lloyds Bank was built in 1906 as the Capital and Counties Bank. Howlett’s Toy Shop started its days as Leggett & Dyers Garage, complete with petrol pumps next to the pavement. For a while the Auxiliary Fire Station and then in the Second World War was used by the Dutch Army. Percy Mozart Fitchew’s Restaurant followed, which became Howlett’s shop in 1950. Allen’s Ironmongers next to the library was built in 1925 when Mr Allen transferred his business there from the High Street. 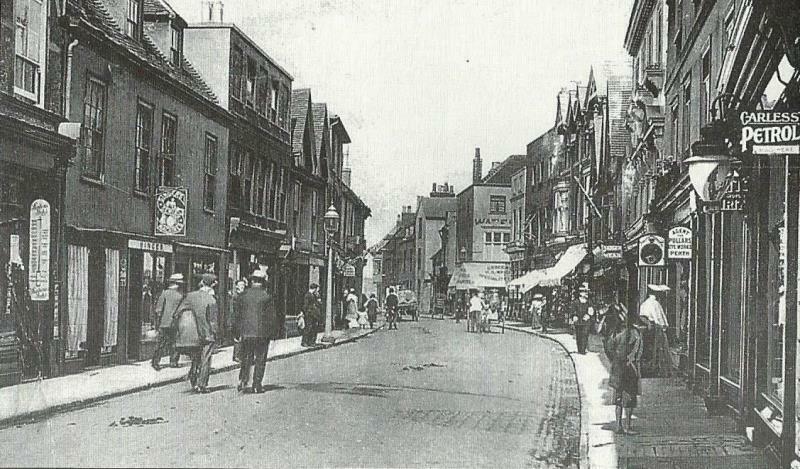 The shop next door was first Gieves the Naval outfitters, but they left in 1921 when the Harwich Fleet was disbanded. It then became Mr and Mrs. Hyatt’s Temperance Hotel and later Scace’s Cycle Shop with Miss Last’s Tea Room Over. By the 1950’s this had changed to Howlett’s Cycle shop with Ellison’s Solicitors over. Woolworths. known as the ‘3d 7 6d store’ was built in 1934 by the firm of “Hawkins” and the frontage being increased by one half in 1937. The news that Woolworths was collapsing broke half a decade ago. It hardly seems possible that it was five years ago that Woolworths revealed it was going into administration, but on Tuesday 26th November half a decade will have passed. The demise of the general merchant marked the start of an unprecedented period of change for the UK’s high streets – from a tranche of administrations to mobile and click-and-collect, a lot has happened since. We had Basham’s for tobacco and Bennett’s fresh baked bread right next door was Trenwith’s where the daily news was read. Across the road was Harris’s for good old fish and chips Tricker’s Café to have a cuppa Petch’s shop of odds and snips. 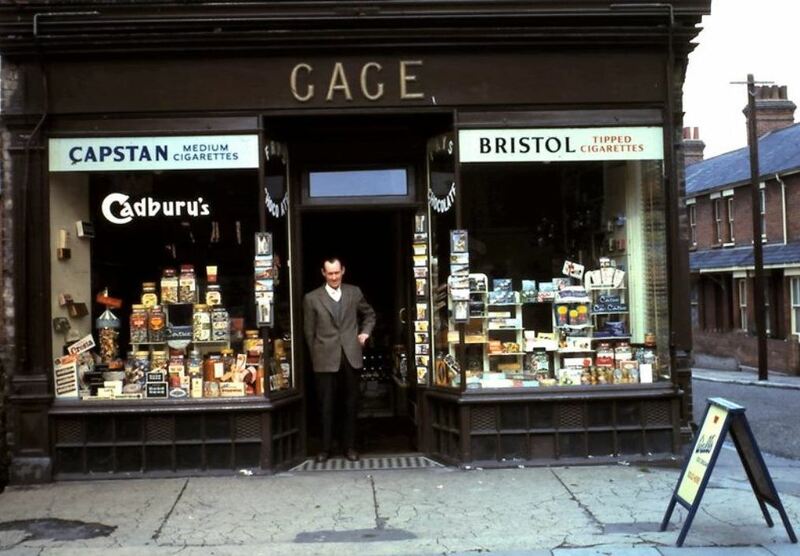 Spurge’s for a smart new suit, Sewell’s for dairy produce, Dennant’s was a toy shop, and Starling’s sold car juice. For amusement we had Beale’s arcade, the Co-op butcher did adjoin and we also had a Singer shop then Dunn’s for meat so fine. On the other side was Well’s and the Maypole grocery store, also Denney the fishmonger with fresh fish by the score. Thompson, Rice’s, Leslie Horn, to name but just a few, Gordon Woods and Coral’s café, Home and Colonial too. None of the names are there today none of the shops we knew How wonderful the memories are of the days that used to be and I hope this little ditty reminds you as it did me. 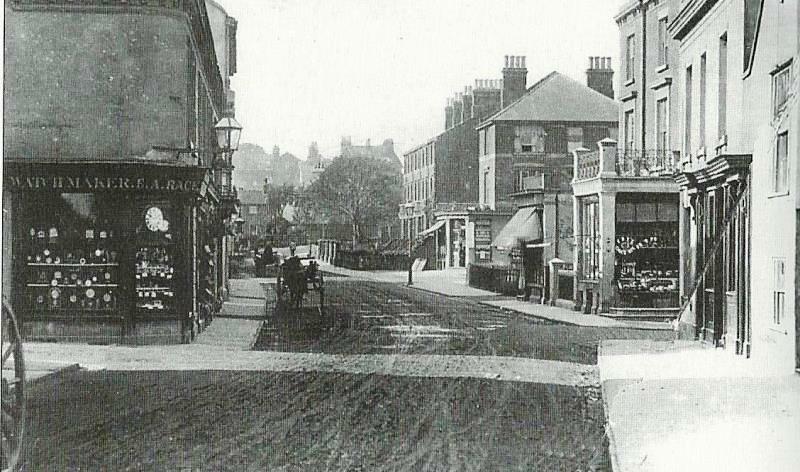 Looking sown High Street from its junction with Hill Road in the very early 1900’s, the shop on the corner is a bakery. On the other side of the road is Mill Lane and the shabby-looking residential cottages go down to Hordle Place. On the opposite corner are the premises of Saunders 104-106 and the row of shops go down as far as the new Co-operative building. Other retailer include Curtess (fishmonger and poulterer) and Norman Tricker (butcher). The Arcade, in Dovercourt high street, fronts six shops. the shops and arcade were built in 1932 by Mr John Elliot, of Mill House, Dovercourt. In 1975 Dovercourt’s only arcade was given a reprieve – it should have been demolished in January, but plans fell through. Mr Sydney Simmons owner of Simmons Jewellery shop felt that the Arcade should either be pulled down or repaired. “I repaired the section in front of my shop about five years ago, and would have liked to see the arcade stay. 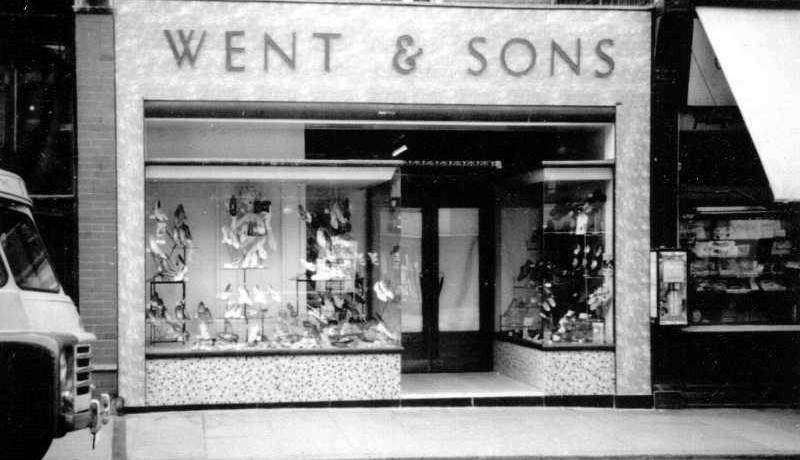 The end shop was built by Percy Howlett in 1946, and the family lived in the flat above the shop until they moved into the shop in Kingsway in 1952. It started off as a cycle sales and repair shop and later went into toys and sports as the country came out of rationing in the post war years. This picture shows Candy Corner in 1962. Where now stands Steel House at the corner of High-street and Cliff-road, Dovercourt, once stood a garden and a tennis court. The houses and gardens at the end of cliff-road will be remembered by many people. The Record shop, a branch of Telexradio, brought Dovercourt a real service for all kinds of recorded music. The firm was started just after the war by Mr. Stephen Sterling, who, on leaving the R.A.F. went to Marconi’s before opening his first shop in Clacton. Mr. Sterling decided to extend this service to the Harwich and Dovercourt area, The new shop in Dovercourt was designed so that the stock is contained on a central island and this meant that customers can see all the latest records without a lot of searching about. Mr. and Mrs. Ronald Wright opened a new fashion shop in Dovercourt Known as Elaine Fashions, the modern designed shop catered for the full range of fashions. Fuller fashions were catered for and the staff was always willing to give advice should customers wish to ask anything about the stock. 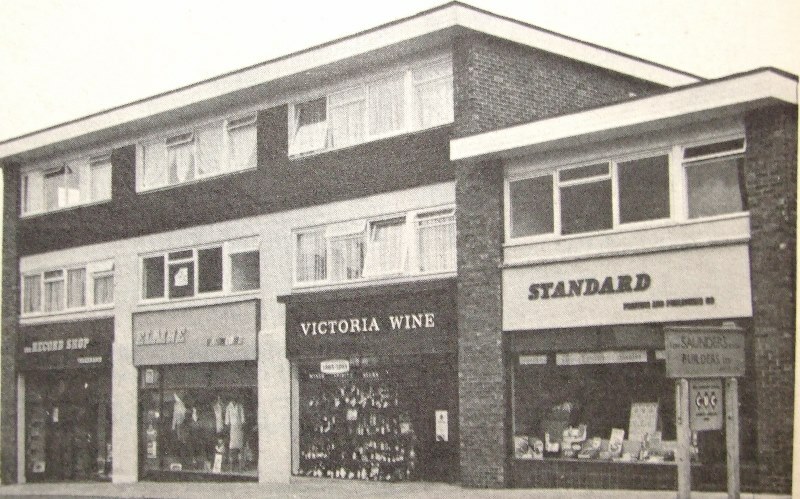 Victoria Wine which had over 800 branches throughout the country decided to select Dovercourt in 1965 as its latest branch. The manager, Mr. F.A Sibley, who served on minesweepers throughout the war, went into the wine and spirit trade on leaving the Royal Navy and, in 1960, joined Victoria Wine Co. Ltd. The new shop was designed so that the vast range of drinks is on display, labelled and priced, enabling customers to choose freely from the “self-service” racks if they want to. Customers could also order bottles for delivery to other parts of the country at the Dovercourt branch. The wine connoisseur could find all he wants at the branch and Mr. Sibley was always pleased to help anyone who wishes to learn more about wines. The new premises of the Harwich and Dovercourt standard provided modern office accommodation with a public counter at street level to deal with advertising sales, accounts and photographic orders, as well as editorial inquires. The editorial staff were accommodated on the first floor, with an interview room available on the lower floor. Main Road Musical and Electrical Stores, Upper Dovercourt. 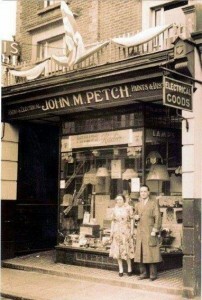 The owner Frank Petch also had existing premises at 63 High Street, Dovercourt. The shop sold radios and electrical goods; the shop is now the Upper Dovercourt post office. Starting from the west side of the village, the first shop you would find would be Mrs Spindler’s little general shop at the end of Una Road. moving into Station Road, you would find Mr Dace, the barber. crossing over Station Road into Garland Road, at the corner of Adelaide Street were the (in those days) imposing buildings of the Co-op. The Co-op provided the village with a drapery store which sold clothing, shoes, wools etc. next to the drapery was the grocery store with its manager, Mr Martin (followed by Mr Ron May. The butchery was next (presided over by Mr Stan Hazelton). moving along Garland Road, at the corner of Tyler Street, was Mrs Brown’s shop where she sold greengrocery in one shop and just about everything else in the little shop fronting on to Garland Road. further on in Garland Road was the fish shop which sold ‘wet fish’ in the little shop and fried fish and chips in a shop at the back. The fish shop was owned by Mr Seago and his son Hugh. Next to the fish shop was the post office run by Mr Arthur King. On the corner of Hamilton Street Enid Hazelton ran a ladies hairdressers, and next to Enid was Mickey Good’s bakery, with delicious freshly baked rolls!. I also remember Alan Bloomfield’s shop on the other side of Garland Road and next to that was the public house, the Garland Hotel. A little further along Garland Road was another drapery and clothes shop owned by Miss Howard, and next to Miss Howard was the chemist shop. A little further along Garland Road was another Butcher’s shop owned by Jack Strawson. 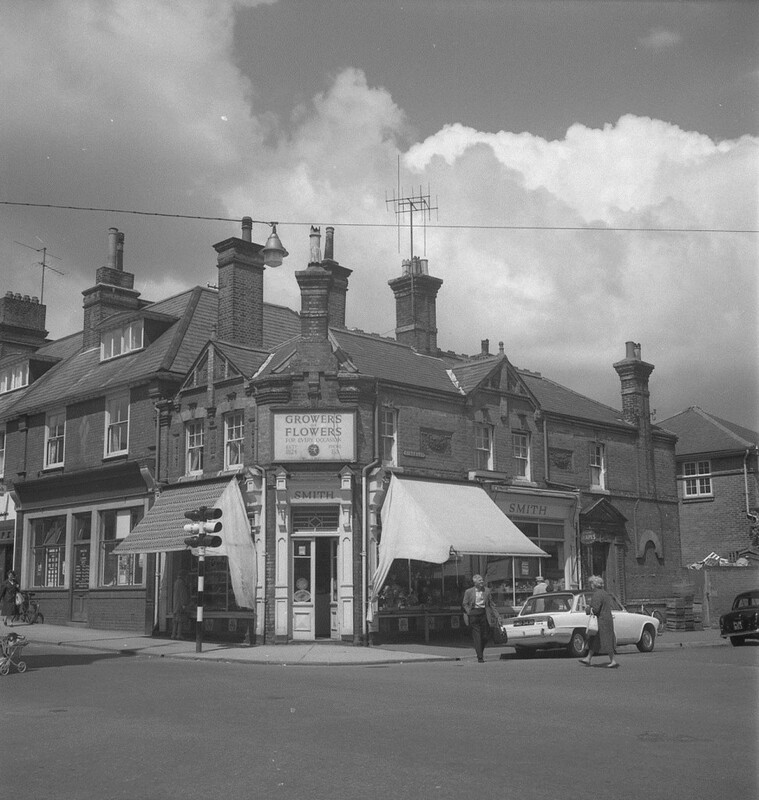 It was also possible to buy sweets and chocolate, cups of tea, cakes and biscuits, and lemonade from the Railway Club in Station Road, run by Mr Alf Precious. These shops were full of counters and white cardboard boxes. The assistant presided against a background shelves all stacked with rolls of coloured stuffs and cardboard drums would round with bright ribbons. “It was a long time ago, but that was what shopping was about”. 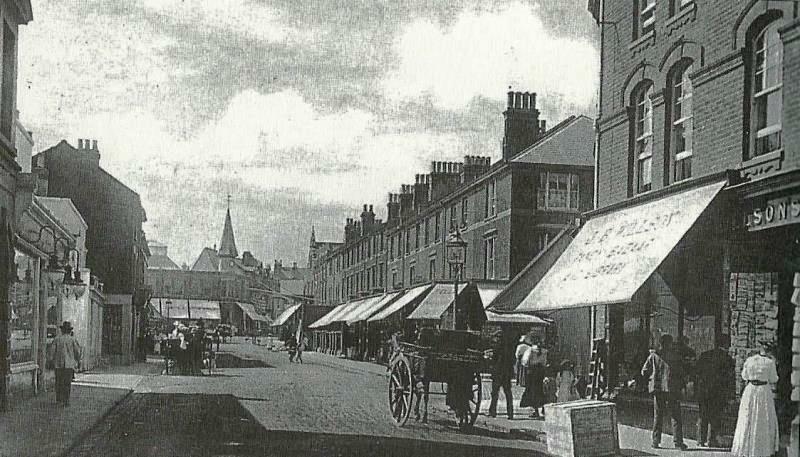 Like other towns years ago, Harwich, Dovercourt and Parkeston once thrived with a host of independent traders – rather than the generic chain stores we see today. Click “Play” to start the gallery slide show. Some of the information is taken from the books of Phil Cowley, Harwich and Dovercourt in Old Picture Postcards, with permission from Mrs Cowley. Thanks to The Harwich Society and all those who have contributed to this project. We owe the late Victorian and Edwardian photographers a great deal as it is their constant output of views, events and people which have enabled me to put together some of this collection together.